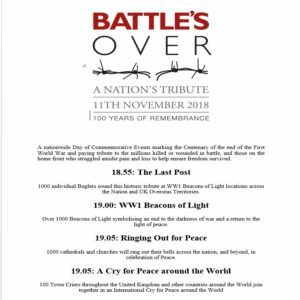 On Sunday 11th November 2018 Liskeard Town Council is playing its part in Battle’s Over, an international commemoration marking 100 years since the guns fell silent at the end of World War I. 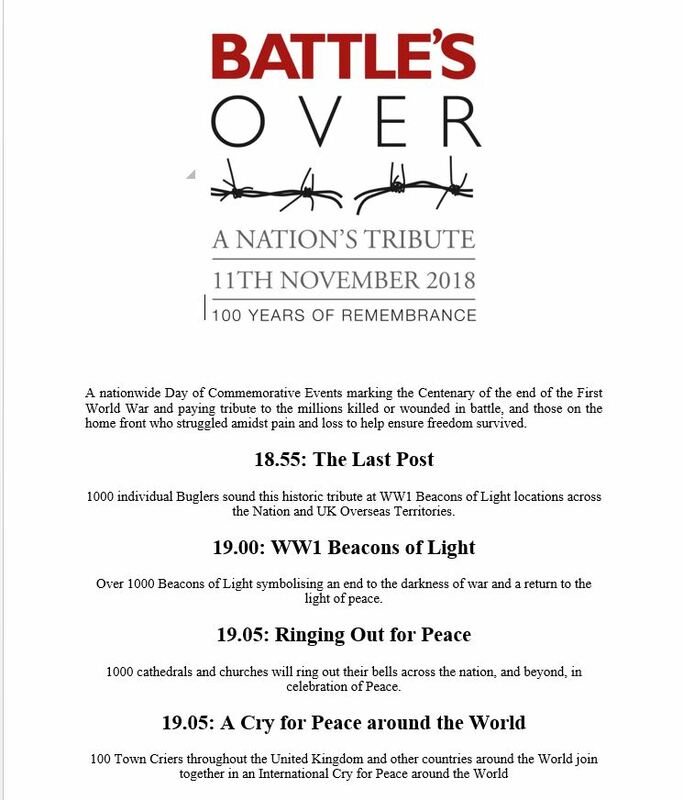 A bugler will sound the Last Post at St Martin’s Church at 6.55pm, this will happen at more than 1,000 locations around the country, then at 7pm beacons will be lit in a tribute called Beacons of Light, signifying the light of peace that emerged from the darkness of four years of war. Our beacon will be lit on the Tower of St Martin’s Church. Then at 7.05pm over 1,000 church and cathedrals will ring their bells as part of Ringing Out for Peace organised in association with the Central Council of Church Bell Ringers, which represents 65 societies of ringers from the British Isles and overseas. Also at 7.05, more than 140 town criers will perform specially written pieces, the first of them in New Zealand and then across the globe through the various time zones. Town Crier, Chris Smirthwaite, has written a piece specially for the occasion.